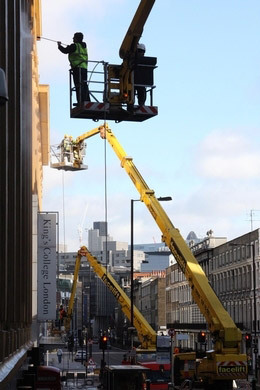 According to the IPAF European Powered Access Rental Report 2011, MEWP rental revenues in the 11 European countries surveyed remained stable and are estimated at €2.2 billion in 2010. This figure represents around 85% of the total European market (defined as the 27 countries plus Norway), which would attain a MEWP rental market value of approximately €2.6 billion. Europe is a diversified market for mobile elevating work platform (MEWP) rentals and 2010 was a year of sharp contrasts, with a difficult first half year and improvements seen in the second half. Growth is expected to be gradual at around 5% per year for 2011 and 2012. The results are based on independent studies conducted by Ducker Research, using mainly primary research in the form of interviews. The sample of rental companies interviewed here represented about 60% of the estimated total MEWP rental market. The European study covers 11 countries: Belgium, Denmark, Finland, France, Germany, Italy, the Netherlands, Norway, Spain, Sweden and the UK. Seven individual country/regional sections are included in the European report. The reports are presented in an easy-to-read format, highlighting key facts and figures for senior management, such as fleet size, utilisation rate and retention period. New for this year is the analysis of fleet mix, comparing the proportion of scissors and booms. In Europe, booms represent around 46% and scissors account for about 49% of the fleet. IPAF has also published the IPAF US Powered Access Rental Report 2011.